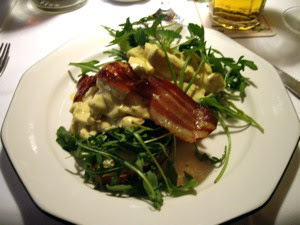 This is not a chicken salad (or at least in its name, it´s not), but a salad made from a hen. It is mixed with sour cream and mayonnaise dressing (I think), added a little curry powder. Served with a slice of good Danish bacon and fresh crispy ruccola it is a hit! !